Here in beautiful North Canterbury we breed, hatch and process our quality free range turkeys ready for you to prepare your culinary masterpiece. We raise big breasted large white turkeys, which consistently produce up to 35% breast meat, giving you exceptional value for your money. Our free range turkeys spend their days roaming around our fresh green paddocks, pecking and nibbling away as they explore the farm. At night the turkeys are moved into the sheds to prevent exposure to harsh weather conditions and protect them from predators. To supplement their natural diet, our free range turkeys are fed a grain formula and are not given any hormones or steroids. All feed is formulated to meet strict FREPNZ standards. All of our turkeys have absolutely no additives. 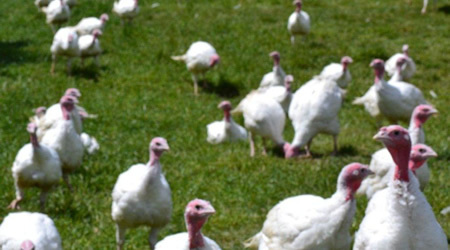 As well as our free range turkeys, also available are our old fashioned barn raised birds. We raise these in large airy barns with low stocking numbers so there's still plenty of room for the turkeys to run around. Our barn raised turkeys are given a grain diet and fresh water. Here at Canter Valley, the welfare of our turkeys are our top priority and we maintain the highest level of farming practices. We hold a certification for free range animal welfare practices, and we're certified by FREPNZ (Free Range Egg and Poultry New Zealand). We believe in our quality turkey products. Turkey meat is low in fat and high in protein, and its great taste is suited to any family meals, dinner party or celebration. Turkey is considered by many to be a 'super food' - it's also a very good source of iron, zinc, phosphorus, selenium and vitamin B, and is one of the leanest meats available. FREPNZ accredited (Free Range Egg and Poultry Australia New Zealand). Free range turkey or traditionally barn raised. Superior meat to bone ratio. 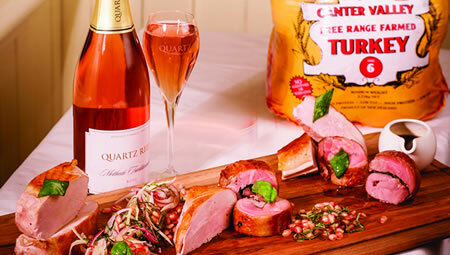 Check out our product range including whole free range turkeys, traditionally farmed turkeys, turkey breast & thighs. Great turkey recipes are just a click away. Click here to view our turkey recipes. For more information please call us 03 3129805 or complete our Enquiry Form.